The Seven Wonders of the Ancient World (from left to right, top to bottom): Great Pyramid of Giza, Hanging Gardens of Babylon, Temple of Artemis, Statue of Zeus at Olympia, Mausoleum of Maussollos, Colossus of Rhodes and the Lighthouse of Alexandria as depicted by sixteenth-century Dutch artist Maarten van Heemskerck. 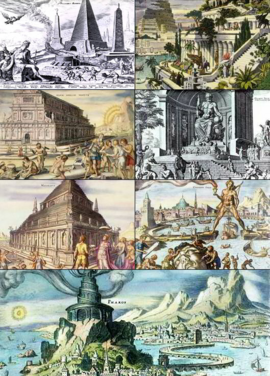 The Seven Wonders of the World (or the Seven Wonders of the Ancient World) is a widely known list of seven remarkable constructions of antiquity. It was based on guide-books popular among Hellenic sightseers and includes only works located around the Mediterranean rim. Later lists include those for the medieval world and the modern world. 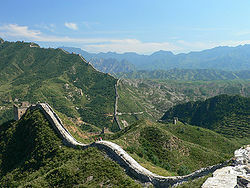 The original Seven Wonders of the World consists of: The Great Pyramid of Giza (the most ancient as well as the only surviving structure), the Hanging Gardens of Babylon, the Temple of Artemis at Ephesus, the Statue of Zeus at Olympia, the Mausoleum of Maussollos at Halicarnassus, the Colossus of Rhodes, and the Lighthouse of Alexandria. The notion of "Seven Wonders" can be traced to a Hellenistic recognition of trans-cultural human achievement that found expression throughout the Hellenistic world. For thousands of years, the Seven Wonders of the World have inspired humankind as representative works symbolic of the great civilizations of antiquity. In terms of innovative design, elaborate construction, technological mastery, and symbolic meaning, the Seven Wonders have not only showcased the high points of diverse civilizations, but tied humankind together in the common pursuit of intellectual excellence and self-expression. I have set eyes on the wall of lofty Babylon on which is a road for chariots, and the statue of Zeus by the Alpheus, and the hanging gardens, and the Colossus of the Sun, and the huge labor of the high pyramids, and the vast tomb of Mausolus; but when I saw the house of Artemis that mounted to the clouds, those other marvels lost their brilliancy, and I said, "Lo, apart from Olympus, the Sun never looked on aught so grand" (Greek Anthology IX.58). A later list, under various titles such as De septem orbis spactaculis and traditionally, though incorrectly, attributed to the engineer Philo of Byzantium, may date as late as the fifth century C.E., although the author writes as if the Colossus of Rhodes, destroyed by an earthquake in 224 B.C.E., were still standing. The Greek category to describe what people call "wonders" today was "theamata," which translates more like "must-sees." Even as early as 1600 B.C.E., tourist graffiti was scrawled on monuments in the Egyptian Valley of the Kings. 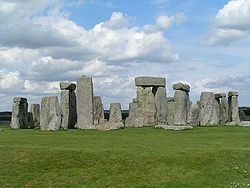 The mature list was compiled in the Middle Ages—by which time most of the sites were no longer in existence. Since the list came mostly from ancient Greek writings, only sites that would have been known and visited by the ancient Greeks were included. Sites from eastern Asia, the Americas, Africa, and northern Europe were thus omitted. Antipater's earlier list replaced the Lighthouse of Alexandria with the Babylon's famous Ishtar Gate. It was not until the sixth century C.E. that the list above was used. 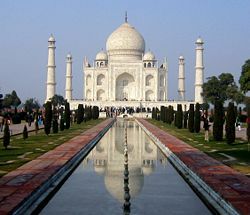 Of these wonders, the only one that has survived to the present day is the Great Pyramid of Giza. One of wonders, the Temple of Artemis, was destroyed intentionally, first by arson and finally by a mob led by the Christian bishop St. John Chrysostom. The Statue of Zeus was destroyed by fire. Four of the wonders were destroyed by earthquakes—the Hanging Gardens, the Lighthouse of Alexandria, the Colossus of Rhodes, and the Mausoleum of Maussollos. (The existence of the Hanging Gardens, however, has not been definitively proven.) There are sculptures from the Mausoleum of Maussollos and the Temple of Artemis in the British Museum in London. 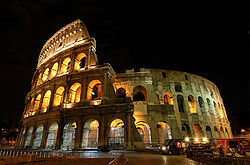 Many lists of "wonders of the world" are said to have existed during the Middle Ages, although it is unlikely that these lists originated at that time. These lists go by names such as "Wonders of the Middle Ages" (implying no specific limitation to seven), "Seven Wonders of the Middle Ages," "Medieval Mind," and "Architectural Wonders of the Middle Ages." Many of the structures on these lists were built much earlier than the Medieval Ages, but were well known. The lists are more properly seen as a continuing type or genre in the Seven Wonders tradition than a specific list. Many lists have been made of the greatest structures built during modern times or of the greatest wonders existing today. Some of the most notable lists are presented below. Empire State Building January 22, 1930 May 1, 1931 New York, NY, U.S.
Golden Gate Bridge January 5, 1933 May 27, 1937 Golden Gate Strait, north of San Francisco, California, U.S. In November 2006, the American national newspaper, USA Today, in cooperation with the American television show, Good Morning America, revealed a list of New Seven Wonders as chosen by six judges. The wonders were announced one per day over a week on Good Morning America. 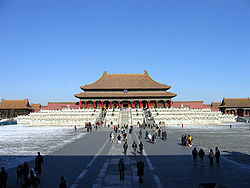 An eighth wonder was chosen on November 24 from viewer feedback. Travel writer Howard Hillman is one of many such writers who has compiled lists of the top man-made and natural tourist travel wonders of the world. 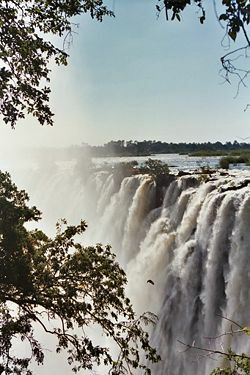 Victoria Falls, seen from the Zambian side. ↑ John Freely, The Western Shores of Turkey: Discovering the Aegean and Mediterranean Coast. Retrieved October 29, 2008. ↑ American Society of Civil Engineers, Seven Wonders. Retrieved October 30, 2008. ↑ New 7 Wonders, New Seven Wonders. Retrieved October 30, 2008. ↑ New 7 Wonders, Finalist Page. Retrieved October 30, 2008. ↑ Bell South, Egypt Angered at New Wonders Idea. Retrieved October 30, 2008. ↑ ABC, Opera House snubbed as new Wonders unveiled. Retrieved October 30, 2008. ↑ USA Today, New Seven Wonders panel. Retrieved October 30, 2008. 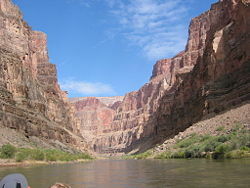 ↑ USA Today, The world's 8th wonder: Readers pick the Grand Canyon. Retrieved October 30, 2008. ↑ CNN, CNN Natural Wonders. Retrieved October 30, 2008. ↑ Unixl, Underwater Wonders of the World. Retrieved October 30, 2008. ↑ Amiguitosdefrontera, 2nd list of Underwater Wonder. Retrieved October 30, 2008. ↑ Howard Hillman, World's top 10 man-made travel wonders, Hillman Quality Publications. Retrieved June 19, 2013. ↑ Howard Hillman, World's top 10 natural travel wonders, Hillman Quality Publications. Retrieved June 19, 2013. Cox, Reg, and Neil Morris. The Seven Wonders of the Modern World. Chelsea House Publications, 2000. ISBN 0791060489. Cox, Reg, Neil Morris, and James Field. The Seven Wonders of the Medieval World. Chelsea House Publications, 2000. ISBN 0791060470. D'Epiro, Peter, and Mary Desmond Pinkowish. 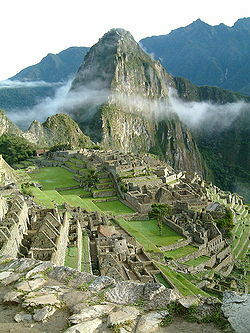 What Are the Seven Wonders of the World? and 100 Other Great Cultural Lists. Anchor, 1998. ISBN 0385490623. Morris, Neil. The Seven Wonders of the Natural World. Chrysalis Books, 2002. ISBN 184138495X. 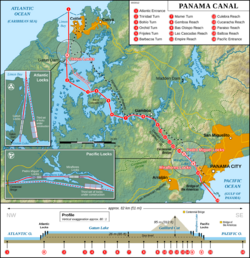 All links retrieved June 25, 2014. "Eternal wonder of humanity's first great achievements" by Jonathan Glancey, The Guardian. History of "Seven Wonders of the World"
This page was last modified on 25 June 2014, at 23:18.